We’d love your help. Let us know what’s wrong with this preview of To Serve Them All My Days by R.F. Delderfield. To ask other readers questions about To Serve Them All My Days, please sign up. We saw the 1980 Masterpiece Theatre series compliments of Netflix. Then I wanted to read the book. The series followed the storyline almost completely. Reading the book after seeing hours of the characters on the film, made it seem like visiting old friends. Below is from the end flaps of the 1972 first printing of the book (obtained on order from the local library). "... an England emerging from the horrors and bloodshed of the 1914-18 war into the twenty years of change, upheaval and uneasy pe We saw the 1980 Masterpiece Theatre series compliments of Netflix. Then I wanted to read the book. The series followed the storyline almost completely. Reading the book after seeing hours of the characters on the film, made it seem like visiting old friends. Below is from the end flaps of the 1972 first printing of the book (obtained on order from the local library). "... an England emerging from the horrors and bloodshed of the 1914-18 war into the twenty years of change, upheaval and uneasy peace that ended with the Second World War. [The:] hero is a schoolmaster, David Powlett-Jones, who survives the dreary carnage of the Western Front to become a teacher at a remote English "public" school, gradually maturing from a shell-shocked veteran scarcely older than his charges into a great headmaster, whose influence touches and changes the lives of hundreds of boys who pass through his care. "Yet there is more here than history, for R. F. Delderfield is above all a master storyteller, whose characters take on lives of their own and exercise such power over our imagination that they become part of ourselves. "... preparing his boys for a life of uncertainty and violent change, teaching that the old English values of honesty, courage and a love of justice are still worthwhile even in the age of Hitler and Stalin." I would add, the author and the main character have a true heart for the developing character of young boys - even more remarkable given the isolated living situation of a boarding school. The best parts of the story happen when we see grace and mercy extended wisely so that the boys develop true character. I sometimes still wake up in the morning and look forward to reading more about P.J. and Bamfylde. The book could have gone on another thousand pages as far as I'm concerned and I would have been riveted. Very English. A great tutorial on the British Boys' School and how that effects their society. I think I deserve one of those shiny silver star stickers on my forehead for getting through all 678 pages! My paperback was literally falling apart in my hands and required frequent sticky tape first aid as I read. As my friends know, I love chunky sagas and epics but I'll be honest with you. You could EASILY chop 200 pages off this without affecting the story one iota. IN A NUTSHELL: A shell shock soldier ( WW1) is discharged from a lengthy hospital stay and is encouraged to take a post at a boys boarding school by his neurologist. What follows is 20 years as a teacher and mentor and how one school gave a shell of a man a new lease on life and reason to live. The first half was 5 stars for me but I wish his first wife could have held up a bit longer (I'm not spoiling it, its in the description and come on, it covers 20 years so nothing is permanent) I really liked her a lot and wished things could have been different. His future love interests I didn't care for so much. One character is very into politics and my eyes start glazing over when you mention Tories and liberals, so you can imagine I found these bits hard going. The school subjects/methods also got a little tedious after a while but it is a book about a boarding school so what did I expect, right? For anyone in the education field this book would be fascinating. The writing itself is very readable and the characters well portrayed and individualistic. It's a good story and worth reading. A remarkable novel. A clear evocation of an era long gone by; sentimental in the best sense of that word—honest about what matters, valuing it, and figuring out how to live in it. The story takes place between two wars, the first and the second--the big ones, as they are often characterized--and follows the career of a veteran of the first who comes to this lonely outpost for healing. He finds himself here—a teacher‚ and grounds himself. It is a nostalgic book; at times, a very sad book--I read A remarkable novel. A clear evocation of an era long gone by; sentimental in the best sense of that word—honest about what matters, valuing it, and figuring out how to live in it. The story takes place between two wars, the first and the second--the big ones, as they are often characterized--and follows the career of a veteran of the first who comes to this lonely outpost for healing. He finds himself here—a teacher‚ and grounds himself. 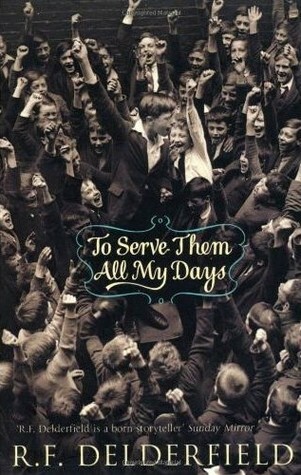 It is a nostalgic book; at times, a very sad book--I read often with tears in my eyes, especially as I neared the end. It is also a thoughtful reflection on education, the healing power of relationships, and the purpose of life. Sometimes as I wend my way to the end of a book, I slow down; I don't want it to end--not because I'm afraid of how it will end but because I like "living" there and want to stay. This is one of those books. I really enjoyed this (the subject of a Masterpiece Theatre back in the early 80s) story of an English schoolmaster at a country "public school" from 1918-1940. Read this last year along with Delderfield's trilogy A Horseman Riding By, now he is one of my favourite authors. Behind all the stories is the larger theme of the beautiful Western Civilisation as it manifested itself in country life in Wales and Southwest England before the Great War and how the tremendous loss of life and morals impacted on that previously sheltered world. As a Jew I notice that RFD includes at least one, usually of foreign origin, Jewish character in each of his books and trea Read this last year along with Delderfield's trilogy A Horseman Riding By, now he is one of my favourite authors. As a Jew I notice that RFD includes at least one, usually of foreign origin, Jewish character in each of his books and treats each with understanding and empathy. The BBC production is nice, but the book is a real classic. When I went to high school in the States in the 70's this wasn't on the menu, I suppose because it's British, was published too recently, and/or the Judeo-Christian morality behind the stories was out of line with the 60's and 70's anything goes preferences of academic staff at the time. I would recommend this book to any young person who wants to enjoy a romantic and heart-warming story and at the same time learn something about the changes after world war I which have made the UK and the Western World what it is today. The television mini-series is even better, because Andrew Davies is a god of page-to-screen adaptation. I simply wallowed in this book almost smelling the lavender polish on the wood of the school. I was taught by men who were probably the pupils in this sort of school. To them your own achievement and sense of self worth was more important than exam results that the current age is obsessed with. The boys in the book radiated decency and honesty deep down. There were clear boundaries of good conduct and morals which carried the characters in good stead throughout life. The battered shellshocked WW I simply wallowed in this book almost smelling the lavender polish on the wood of the school. I was taught by men who were probably the pupils in this sort of school. To them your own achievement and sense of self worth was more important than exam results that the current age is obsessed with. The boys in the book radiated decency and honesty deep down. There were clear boundaries of good conduct and morals which carried the characters in good stead throughout life. The battered shellshocked WWI boy/man who arrives is slowly healed by the school and it's Headmaster. His faith in mankind is restored by the steadyness of the school's atmosphere and routine. Gradually he is able to form relationships again and marries. The book takes him through crises and out the other side right through to being able to cope with seeing his own pupils getting involved in WWII and paying the ultimate price. He recognises the necessity of the war for the survival of Great Britain and is able to feel a pride in their sacrifice as well as the futility in the battle he fought in WWI. Adaptation of RF Delderfield's classic drama set between the two world wars. SPLENDID!! I just mooched another book by this author. This book was first published in England in 1972 and is probably the most well known of R.F.Delderfield's novels. It is over 600 pages in length and immensely readable. It follows the life of miner's son David Powlett-Jones from the point where he returns from the carnage of world war 1 in 1918 severely shell-shocked and devastated by the horrifying conditions of life in the trenches and the dreadful toll of deaths. He starts life again as a schoolmaster at a small public school in Devon in char This book was first published in England in 1972 and is probably the most well known of R.F.Delderfield's novels. It is over 600 pages in length and immensely readable. It follows the life of miner's son David Powlett-Jones from the point where he returns from the carnage of world war 1 in 1918 severely shell-shocked and devastated by the horrifying conditions of life in the trenches and the dreadful toll of deaths. He starts life again as a schoolmaster at a small public school in Devon in charge of boys, the eldest of whom are not that much younger than he is. The novel follows him through the years of his life spent there. There is both sadness and joy as in most lives as he learns to adjust and turn into a very talented history teacher and a valued member of staff. I found this book to be totally absorbing and it gripped me throughout. Though there is much descriptive background it never bores. The novel has a real emotional poignancy that touched me deeply. The contrasting characters are beautifully drawn and are written with great depth. It is a very moving book and a fascinating read! I confess I did get a little bogged down in parts where the story went into the politics of the time, but that is a personal opinion only. This is one of the best books I have read in a long time. A beautiful novel set in a boarding school between the World Wars. Lt. David Powlett-Jones arrives in the countryside, suffering shell-shock and looking to find a way back into the land of the living. Along the way, he finds love, friendship, hope, and tragedy. Terrific novel, made into a great BBC miniseries. FANTASTIC. Far superior to Mr Chips, It works on many levels - as a teacher, student story, as an anti-war novel, as an insight into an overshadowed period of British History and as a sprawling, epic novel. DNF. Too much British slang for this California girl. I read all of this series years ago and loved them; I learned more history from this series than in any classroom and it made more sense too! The changes wrought upon England by WW I were earth-shaking; all of society was forever changed, as were those who were involved in the actual combat and serving at home. Glad to know they're still in print and being read!! "...a book about a ... more modern England, an England emerging from the horrors and bloodshed of the 1914-18 war into the twenty years of change, upheaval and uneasy peace that ended with the Second World War. "[The] hero is a schoolmaster, David Powlett-Jones, who survives the dreary carnage of the Western to become a teacher at a remote English 'public' school, gradually maturing from a shell-shocked veteran scarcely older than his charges into a great headmaster, whose influence touches and c "...a book about a ... more modern England, an England emerging from the horrors and bloodshed of the 1914-18 war into the twenty years of change, upheaval and uneasy peace that ended with the Second World War. "[The] hero is a schoolmaster, David Powlett-Jones, who survives the dreary carnage of the Western to become a teacher at a remote English 'public' school, gradually maturing from a shell-shocked veteran scarcely older than his charges into a great headmaster, whose influence touches and changes the lives of hundreds of boys who pass through his care. "No living English writer can match Mr. Delderfield in his ability to encompass whole generations, to show, in loving detail and with a scrupulous attention to truth, the vast changes in an England moving from the comfortable certainties of the Victorian Age through the tragedies of the Great War, the moral perplexities of the Twenties, the great strikes, the years of the slump and the dole of the hungry Thirties, on into the glorious Forties, in which England atoned for the appeasement and isolation of the Age of Illusion. His sense of history, his loving re-creation of real events, his almost Churchillian understanding of the English character and genius, have led critics to compare him with such great masters of the traditional English novel as Trollope and Galsworthy, comparisons which grow more apt with each new novel from his pen. "Yet there is more here than history, for Delderfield is above all a master storyteller, whose characters take on lives of their own and exercise such power over our imaginations that they become part of ourselves. Powlett-Jones, whose happy marriage -- doomed as it were, by the sense that no happiness could emerge or survive from an experience like the 1914-18 war -- ends in unexpected tragedy, gains, through his experience, his friends and his boys, the wisdom, strength of character, honesty and common sense that make it possible for him to bear the loss of his beloved wife, to endure a decade of intrigue and rivalry over the control of the school that has become his life, and to emerge as a man of remarkable strength and passion, fulfilled in love, accepting as headmaster the heavy charge of preparing his boys for a life of uncertainty and violent change, teaching that the old English values of honesty, courage and a love of justice are still worthwhile even in the age of Hitler and Stalin. "Those qualities that have made Delderfield's novels best sellers are more than ever in evidence in this deeply moving book about the England of his own youth and maturity; in it, he has written the saga of his generation, and made of it a classic, sinewy, packed with incident and characters, illumined by a wise and deeply compassionate view of human nature and the English experience." Whew! That was some review, wasn't it? But it touched on why I loved this book, and all the others in this same genre: "the old English values of honesty, courage and a love of justice are still worthwhile." These sorts of books are my comfort and escape from the world today which often seems so barbarous and without any values other than greed and amorality. Fantastic - Delderfield is a fantastic writer, and though I was disappointed to find that this was his final book (published in 1972, the year he died), I am delighted to see that he was a pretty prolific writer and there is much more for me to enjoy in his other works. David Powlett-Jones is blown out of a trench in 1918 and shipped back to England to recuperate, never to return to the battlefront in Europe - physically recoverable but suffering from shell-shock. His doctor suggests that he con Fantastic - Delderfield is a fantastic writer, and though I was disappointed to find that this was his final book (published in 1972, the year he died), I am delighted to see that he was a pretty prolific writer and there is much more for me to enjoy in his other works. David Powlett-Jones is blown out of a trench in 1918 and shipped back to England to recuperate, never to return to the battlefront in Europe - physically recoverable but suffering from shell-shock. His doctor suggests that he consider teaching as a means to improve his recovery, and he is sent to a rather remote boys' school, Bamfylde School. Not long into his visit, he agrees to give it a try, and Delderfield builds his story through more than two decades of P-J's time at Bamfylde. Twenty plus years in the life of a British schoolmaster, from the end of the first World War to the start of the second. Davy Powlett-Jones arrives at Bamfylde as a shell-shocked young man without the social background or degree to survive in the world of a privileged public (i.e. private) school. The headmaster, however, sees something in him that makes him hire Davy, who gradually comes to love the school and its students. This is a perfect book for those who love British school stories, but wa Twenty plus years in the life of a British schoolmaster, from the end of the first World War to the start of the second. Davy Powlett-Jones arrives at Bamfylde as a shell-shocked young man without the social background or degree to survive in the world of a privileged public (i.e. private) school. The headmaster, however, sees something in him that makes him hire Davy, who gradually comes to love the school and its students. This is a perfect book for those who love British school stories, but want a more adult take. It’s full of episodic student drama, family drama, tragedy, adventure, joy, school politics, national politics, and a setting so realistic you feel as if you're there. I thoroughly enjoyed this book, although it got long towards the end. This is a story about a young man who returns from WWI a shell-shocked soldier, and is placed as an English teacher in a boys' boarding school in the country, as as way to heal. He ends up making this his career. I loved the plot, characters, descriptions of the time and place, etc. It's interesting - I never could get into the author's better known book: God is an Englishman. My favorite book. Bought it at a book sale for fifty cents, then discovered it was made into a miniseries on Masterpiece theater. I bought that for considerably more than fifty cents, but loved it anyway. There should be some great words of wisdom to impart from those two events, but alas none. I still love the book. I may buy it for my Kindle. Ronald Frederick Delderfield was a popular English novelist and dramatist, many of whose works have been adapted for television and are still widely read. Several of Delderfield's historical novels and series involve young men who return from war and lead lives in England that allow the author to portray the sweep of English history and delve deeply into social history from the Edwardian era to the Ronald Frederick Delderfield was a popular English novelist and dramatist, many of whose works have been adapted for television and are still widely read. Several of Delderfield's historical novels and series involve young men who return from war and lead lives in England that allow the author to portray the sweep of English history and delve deeply into social history from the Edwardian era to the early 1960s.